Alright, alright, I better stop with the romantic jibber-jabber now before it gets out of hand and I see a plethora of "Touch Me!" jokes come into play. But the truth can be told- this is not your typical Monkey Ball game. Instead of giving you some straightforward puzzles to complete, the folks at Travellers Tales have instead put together a platforming adventure involving monkey ball characters, as they roll around in an effort to unite some islands thrown into disarray by greed and mistrust. Never mind that the republics involved should be solving their own damn problems instead of trusting primates in spheres. Travellers Tales had some ideas, but that's not to say they were good ones. In fact, far from it. The whole platforming game seems broken, not only because of the revamped gameplay mechanics to try and make them mesh with the formula but also because it's just tepid. You're basically given a number of fetch quests and objectives to complete by incompetent monkey characters who AREN'T in monkey balls. Got that? They aren't limited by anything and yet they want you to go and do all their work. Most of these tasks are boring, and require a great deal of exploration and dealing with frustratingly small ledges and item acquirings to get ahead. The exploration part would've been fine, had there been something here actually worth exploring. The graphics are alright, but won't stir the imagination up any. The frame rate moves acceptably enough, and the graphics are cute as all get out. So is the sound, for that matter. You'll be so damn tired of all the monkey speak that you'll probably blare some Judas Priest right into your cranium just to drive their dialogue out of your brain. (Yes, it's that bad.) The game also suffers from some terrible load times, almost up to the minute/minute and a half count. For a game so simply designed, it sure is taking its damn sweet time to get anywhere. 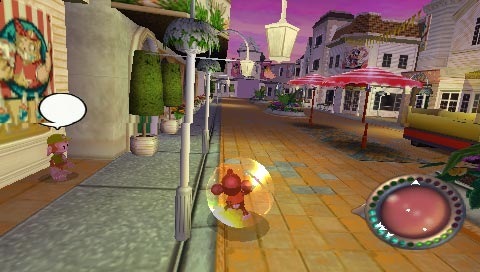 Aside from the mundane platforming game, Super Monkey Ball Adventure does have a few other offerings. The game has some mini-games that can be played against others who have a copy of the game, a total of six. Sadly, the big ones, namely Monkey Bowling and Monkey Golf, are long gone. The ones that remain, including a take-off of Othello and an interesting Warlords-esque tank game, can be fun, but it would have been great to have some variety here. There's also some single player challenge levels to defeat, but there's only fifty, and only the higher-ups will really require any kind of thinking. Oh, and something should be said about the power-ups in the game- they're lame. It would have been cool to give the monkey some ability with their ball, like getting out and smacking enemies around with the edges or even hurling it at enemies, but instead we have the boxing glove on a spring and the temporary effects, including one that sets your monkey on fire. Unfortunately, the fire doesn't last, and you survive to continue on through the level. Oh, how twisted is thy fate! 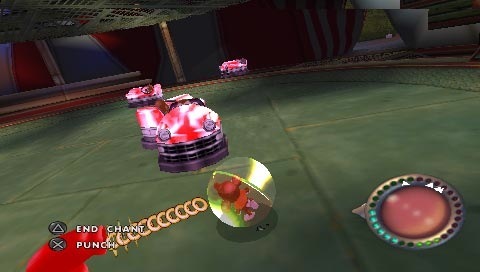 The game does have some exclusive PSP features, such as dealing with cards via collectibles and gaining access to a spell that turns your ball into a banana-sucking machine. But they really don't do that much for the flow of the game. Designing your own card sounds appealing, but really, you'd probably have more fun just drawing up a valentine and giving it to your girlfriend. Super Monkey Ball Adventure isn't really that fun. Travellers Tales didn't think the whole concept through, and as a result, the game suffers. The multiplayer action can be enjoyable, as well as the Challenge rounds, but that's kind of sad. The game's at its best when it does the same old thing and doesn't strike out for anything new. Hmmm, maybe that's a hint, Sega. Maybe next time you should just let us roll on and never mind the natives who can't do a damn thing for themselves. How were the buildings erected, then? Did they grow out of the ground? Never mind, that's a matter for a monkey, not me. What's Hot: Multiplayer mini-games can be fun; some new challenge levels. What's Not: The main game is repetitive and boring; too much loading going on.